Marissa Farrar: For the Fourth Day of Creepfest... Welcome Annetta Ribken! For the Fourth Day of Creepfest... Welcome Annetta Ribken! Hi Everyone! I hope you're all enjoying Creepfest and meeting lots of new authors. 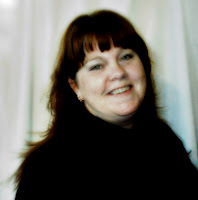 For today I have author Annetta Ribken. M.F. don’t describe yourself as a horror writer though your novel, Athena’s Promise, contains monsters and your short story collection is described as being escorted ‘deep into twisted, cobwebby parts of the characters minds’. So how would you describe your writing? A.R. Not Nice and Other Understatements does contain stories which could be considered horror, but there are also literary stories, fantasy stories, even a romance of sorts. 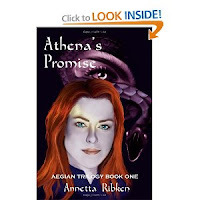 Athena's Promise is urban fantasy (or paranormal fantasy), but my opinion is a good writer transcends genre. I think labels are more for marketing purposes than anything else. For some reason I have an aversion to being pigeonholed into a certain genre, because I don't want to be limited. I guess if I had to choose a specific label, it would be "speculative fiction" just to keep my options open. M.F. I see you offer editing services as well as your books. What do you think makes a good editor? A.R. I'm a content editor, which means I evaluate a piece for story arc, characterization, plot, and narrative flow. A good editor understands the structure of a story; is able to put ego aside completely; exhibits an extraordinary attention to detail and is able to suggest changes or improvements which enhance and strengthen the story the writer wants to tell without changing the "voice". You have to be able to see the big picture as well as the component parts which makes it work. A good editor also has to understand her client and how they work, which means you have to be empathetic and flexible. I absolutely love my job. M.F. What do you make of the whole ‘indie’ revolution? A.R. I think it's an exciting time for both readers and writers. As a writer, we now have more options than ever, but that doesn't mean the road to success is any easier. It still takes persistence, marketing savvy, a whole lot of work, and did I say persistence? In my opinion, it's not an either/or proposition as far as legacy publishing vs. indie and every writer has their own path – you have to choose the one which works best for you, and only the writer can determine that. You need to be open-minded and you also need to educate yourself on the changes which seem to happen at a light-speed pace. M.F. And now for some more Christmassy questions... What’s the worst present you’ve ever received? A.R. Is there such a thing as a "bad" present? Heh. Wrap it up and put a bow on it and it's all good – it's the thought behind the gift that matters, not so much what's in it. M.F. Are there any Christmas movies that freak you out? A.R. Not really. I try to stay away from tear-jerkers. My favourite Christmas movies are the Blade Trilogy, A Nightmare Before Christmas and Rocky Horror Picture Show. Not traditional Christmas movies, but I'm not a big fan of the holiday anyway. M.F. How do you normally spend Christmas day? Does your family have any weird traditions? A.R. Since my kids are grown and gone and my mom has passed, Christmas is very quiet. I usually treat it like just another day, but my BFF doesn't let me get away with that. She drags me out in my Grinch t-shirt for dinner, and I have a good time in spite of myself. I'm on the phone with my kids, but the day is typically very low-key. The only weird tradition I can think of that we still practice today is everybody has to have new pajamas for Christmas Eve and a new toothbrush for Christmas Day. Because, you know, dental health is always important. Heh. To find out more, you can find "Athena's Promise" at Amazon and Smashwords. You can also visit Annetta's blog through the 12 Days of Creepfest to win an e-copy, or visit her giveaway on GoodReads for an autographed print copy. "No matter what it takes." As the front desk manager of a hotel on the edge of Zombietown, Pallas is used to dealing with angry centaurs, surly trolls, and zombie housekeepers. The trouble really starts when one of her guests ends up dead. But that's not her only problem. The attractive maintenance guy, endangering the promise she made out of necessity to the Goddess Athena – does he know more than he's telling? Pallas needs to find the killer, and fast, or she'll lose her job, her home, and the ragtag family she's adopted out of her crew of "critters". In the course of the investigation Pallas uncovers connections to a nasty Oddities dealer deep in the heart of Zombietown, forcing her to expose a trauma from her past which could threaten her future. With everyone and everything she loves in danger, the promise made to the Goddess Athena may well damn her if she breaks it, but she is bound and determined to save her friends, her home, and everything she's built. Author bio: Annetta has been writing since words were carved on stone tablets with chisels. Not only does she write her own words, Annetta is also an accomplished editor. She lives just outside of St. Louis with her evil feline overlord, a rescued shelter cat named Athena. Loved the questions, Marissa -- thanks for having me! Netta is muh Edittah! Thanks for having her on, Marissa! I convinced her about the horror transitioning based on some of her story collections, as well. "The Blood Is Not Enough" is vampiric fic. Happy Creepfest! and the captcha is "gonedit" LOL! Great interviewed, enjoyed! I'm currently reading ATHENA'S PROMISE, truly a lot of fun! Looking forward to hearing more about your work, Marissa. I love the design of your place, classy but with a touch of creep. Great combination! A very merry creepfest, from Diary of a Writer in Progress. That captcha is hilarious, Rebecca. Heh. Thanks for all the comments everyone! They're always read and appreciated! *waves back to Jimmy* Thanks for stopping, Jimmy -- it's really good to meet you too!